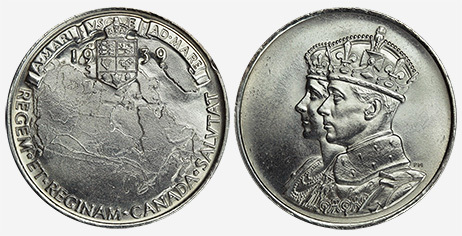 Medal commemorating the first royal visit to Canada in 1939. It was the first time a reigning monarch had visited Canada. In Europe, it was apparent that war was looming, and one of the main reasons for the royal tour was to stimulate Canadian affection and support for Britain in the coming conflict. An enormous amount of work went into the preparation of the royal tour. The King and Queen would arrive in Canada by ship and travel across the country by train. Both the Canadian Pacific and the Canadian National Railways offered their services, and a royal train was assembled, using some of their best carriages. Text : A-MARI VSQ-VE AD-MARE - REGEM.ET.REGINAM CANADA SALVAT. 26 mm bronze medal width. 31 mm bronze medal width. 31 mm silver medal width.